The word "armadillo" is of Spanish origin and refers to the armor-like covering of these animals. The skin is remarkably modified to provide a double-layered covering of horn and bone over most of the upper surface and sides of the animals, and some protection to the underparts and limbs. Young look like miniature adults when they're born, and within a few days their leathery skin hardens into armor. Underparts are covered with soft-haired skin. Hair sometimes projects from under the side plates. Range: The armadillo is the state mammal of Texas. 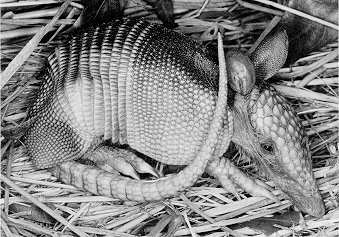 Originally native to South America, the armadillo now ranges as far north as Texas, Oklahoma, Kansas and Louisiana. Found in all but the western Trans-Pecos portion of Texas in a variety of habitats; brush, woods, scrub and grasslands. Armadillo information, photos, facts, pictures, &stuffed plush merchandise. The Mammals of Texas - Online Edition. From Texas Parks and Wildlife.